A Leadership Network Publication ^ Spiritual leaders must become experts in matters of the heart. They must learn to discern God at work in their own lives, shaping their hearts to embrace the particular ministries to which they are called. 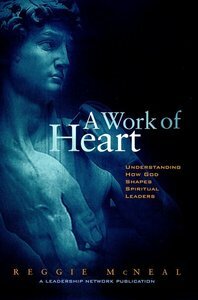 A Work of Heart shows how God prepares leaders today just as he did in biblical times-and how God creates these leaders in order to share his heart with his people. About "A Work of Heart: Understanding How God Shapes Spiritual Leaders"
Reggie McNeal is the director of leadership development for the South Carolina Baptist Convention. Through his various leadership roles, from local congregational settings to denominational positions to seminary classrooms to coach and consultant for thousands of spiritual leaders, he has been devoted to helping leaders understand and practice true leadership greatness. McNeal is the author of Revolution in Leadership: Training Apostles for Tomorrow's Church (Abingdon Press), along with A Work of Heart: Understanding How God Shapes Spiritual Leaders and the best-selling The Present Future: Six Tough Questions for the Church, both from Jossey-Bass. Rehearsing For Eternity 9. Conflict: Learning To Die So We Can Live 10. Collaborating With God?s Heart-shaping Projectreferencesthe Authorindex.